A Palace, or a Mud Hut? We come to what is perhaps one of the discussions that Chloe and I are most apt to have regarding our lives in Karamoja—what should our standard of living be? In San Diego, we lived in fairly moderate circumstances—a small house with a small yard and a moderately-sized television. We spent extravagantly when we could on food and drink and books and life was good. We had less than many of our friends, but we also had more than a good deal of them who lived in apartments or condominiums, who ate much more simply, and who saved much more intentionally. But when we arrived in Karamoja, even sans television and book collection and ownership of property, we had suddenly become one-percenters. This situation almost can’t be helped. Our friends live in mud-and-grass huts. They eat the same inexpensive food more or less every day. Their neighbors are so close that they can almost hear them turn over in bed at night. A couple of bucks a day is a reasonable living wage for most of our neighbors. Hale writes that the closer we can live to the level of the people to whom we are ministering, the more effective our ministry will generally be, but as Westerners, we’ll never be able to get all the way to the level of our neighbors, so what do we do? Initially for us, the problem has been simplified. We signed up to work with an organization that already existed. There were already missionaries there with established lives and lifestyles. There was already a home for us to move into, already a set of norms and expectations for how our lifestyles would be. We were also limited by our travel circumstances. Everything we wanted to take had to fit into six suitcases. Going back we get six more, but the temptation is thankfully tempered by the demands that a new child will be making on our luggage. By American standards, we live very simply, but the truth is that we are suffering very little for the sake of the Gospel. Pray that we will be willing to continue to simplify our lives should we be called to do so. 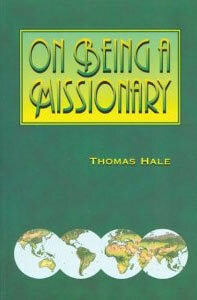 Admitting that the issue of missionary lifestyle is thorny, Hale offers three principles to guide our thinking and decision-making in this matter. First, “nationals, both Christian and non-Christian view missionaries as being ‘too rich. '” He writes that while this can be a nebulous perception, we ought to opt for less richness rather than more, whenever we are able. Second, he suggests that we not keep anything in our home that will make nationals uncomfortable coming in and visiting us. Chloe used to keep many of our food staples on shelves in our sitting area—flour, rice,pasta, and milk. We noticed people coming over for a meal would often focus on these things, and so she decided to put them in a cabinet under the counter instead. We know we aren’t fooling anybody, but neither are we flaunting our relatively opulent lifestyle in this regard. Literally almost every item that we have out in the house is something that our neighbors do not have (books, candy, pruning shears) and so we try to minimize the distraction that these things provide. The third suggestion that Hale highlights is that a house also has to feel like home to us. Like it or not, a home for us requires certain things that our neighbors do not have. Hale writes that we ought to choose these things wisely and be creative in making a home without being a stumbling block to our neighbors. For us this means Chloe’s cheesemaking, my efforts at a bit of landscaping around our house, and the library of books we can carry on our Kindles. We will never achieve the level of living that our neighbors have, but by God’s grace, we try to find a common ground. One of our missionaries in Mbale asked some of the people he works with whether they thought missionaries shouldn’t have so many things. The response was “It’s fine that you have all of these things as long as you are also willing to come into our villages and homes and eat our food and be with us as we are.” May we all be willing to dine with tax collectors and sinners and even those who simply love God in the midst of their poverty. So you throw yeast in a giant pot of poop and you call yourself a biologist?